A new eatery in Resorts World Sentosa is where you can get your fill of the latest food fads. Insadong Korea Town, located near the Trick Eye Museum, offers more than 200 types of dishes that range from traditional Korean and hybrid dishes to street food and desserts. It's a self-service eatery where diners make their choices and pay for the food at self-ordering kiosks. They then pick up their food from various stalls in the 6,000 sq ft eatery that seats more than 300. My favourite is the Bossam or Korean Boiled Pork Wrap ($15 for small). Slices of pork belly are simmered in mild herbs till soft and eaten wrapped in cabbage with sliced garlic, green chilli and chilli paste. The pork also tastes good on its own with a dab of the paste and does not feel greasy at all. Other good dishes include the Ginseng Chicken ($28), which comes with a small serving of evaporated milk to add to the soup if you wish. Desserts include the trendy J-cone ($6), a J-shaped tube made from corn flour that is filled with ice cream. There is also the Churro With Soft Serve And Fruits ($9), an odd Korean twist to the Spanish snack that is rather addictive. Forlina's linguine aglio e olio. Forlino has totally refreshed its menu, courtesy of new chef Yohhei Sasaki. The Italian-trained Japanese chef has worked in various restaurants in Italy, Japan and Singapore, with his last posting as executive chef of Enoteca L'Operetta in Boat Quay. His first menu at Forlino is light and bright, with dishes that stay close to traditional Italian cooking, but refined for modern palates and boasting a number of Japanese ingredients. 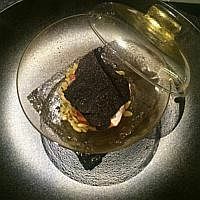 Dishes such as a lobster bisque with pan-roasted lobster, cauliflower foam and cocoa nibs ($26) should find fans easily. 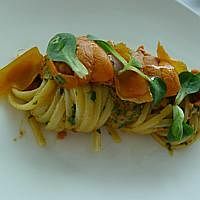 And I'm charmed by a linguine "aglio e olio" ($38) that is topped with Hokkaido sea urchin and Sardinia bottarga. His twist on the tiramisu dessert ($15) turns what has become a cliche here into a new delight. It's a mix of coffee espuma, mascarpone mousse, ladyfingers and cocoa nibs that recalls the flavours in the original version, but with a totally different texture. I've been waiting eagerly to see how chef Jason Tan from Corner House is going to follow up on his impressive debut menu. Is he a one-hit wonder or a rising star who will continue to light up the local food scene? His sophomore menu for dinner ($248 a person) has just been launched and it is a worthwhile follow-up. Only one dish from the first menu is repeated, the Cevennes Onion that comes in various forms, such as confit and as a tea. Others get a new interpretation, such as the New Zealand Cod "Crispy Scales", which is now in a brandade and sits on a poultry essence with soya flavouring instead of the old egg yolk confit sauce. New dishes such as a Japanese Toriyama A4 Beef Tartare help me keep my faith in the chef. The match of beef and different kinds of beet, finely chopped up like a tartare, is truly excellent. And the Surf & Turf Rice is lovely, with riso (rice-shaped pasta) topped by Maine lobster, Iberico pork and black truffles. Chir Chir Fusion Chicken Factory's Fried Chicken. 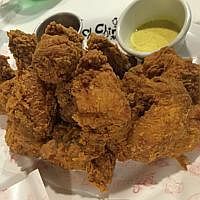 A new Korean franchise has made its way here and Chir Chir (pronounced chiru chiru) is already on my list of places to go to satisfy my craving for fried chicken. The Fried Chicken ($26.90) is really good, with a crisp golden batter covering moist chicken meat that tastes good without the need for the dipping sauce that comes with it. The only problem is that it comes in only one size - an entire chicken, which is enough for two persons provided you do not order anything else. If you want to taste the eatery's other offerings, such as Honey Grape Salad ($18.90), you would need to go in a bigger group. Every dish on the menu comes in just one size - large. There are many other variations of fried and roasted chicken, such as Spicy Chicken ($28.90) and Garlic Roasted Chicken ($32.90). There is also the unusual Nest Snow ($32.90), where fried chicken tenders are placed on a baked cream sauce and topped with whipped cream. That, however, is a bit too strange for me. Book a meal at Forlino or Corner House with Chope.